Joining people together in Christ’s mission. Missions Fest Vancouver is a weekend mission conference for everyone. You’re invited to come for an hour, a day, or the whole weekend. Registration is required. More info soon! Altar Vision: "Offer yourselves as living sacrifices"
What does it look like to live a life surrendered to Christ? The apostle Paul uses expressions like “living sacrifice” (Romans 12:1,2) and “poured out” (Philippians 2:17) to describe the all-or-nothing nature of life lived for Jesus. Jesus is worthy of all our love and adoration. Loving him is our highest calling as Christians and our greatest joy. In return, we experience the love of Jesus like a spring of water that bubbles up in us and flows outward touching our families, church communities, neighbourhoods, and jobs. This water is life. It brings healing and reconciliation and wholeness. Unfortunately, many of us have “stones” in our lives blocking the flow of life-giving water. If you desire to experience more of the life of Jesus, then please join us this year for a journey of consecration that will culminate in the 2020 Missions Fest Conference. It is no surprise that all of us follow Jesus imperfectly, but we’re asking God to reveal to each of us any areas of our lives that need to be adjusted and recommitted to Jesus so that he can rule and reign in us. We believe that where the spring looks like a trickle, there could be a flood! At the prompting of the Holy Spirit, we have called together a group of Christian leaders and their spouses to pray and intercede for this process of consecration. Throughout the year, there will be meditations and articles that you may find useful. Please sign up for “News and Updates” on www.missioncentral.ca and “Like” our Mission Central Facebook page to see posts. 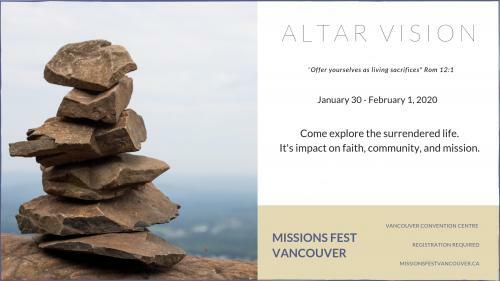 Missions Fest Vancouver will be held at the Vancouver Convention Centre (East) on January 31 and February 1, 2020. We are only meeting on Friday and Saturday*. * Cancelling Sunday provides some cost savings on a day that has often had low attendance, and which has sometimes been perceived as a conflict with local churches. To bring maximum benefit to both agencies and churches, we will be setting up a system to match participating agencies with churches who would like to host them. Some of the things agencies may be willing to do: preaching, overview of ministry, post-service info session.